UBC Nursing professor Carole Robinson has received the Award of Distinction from the College of Registered Nurses of B.C. Carole Robinson's remarkable career in nursing has earned her the Award of Distinction from the College of Registered Nurses of British Columbia (CRNBC). Robinson is the acting Director of the School of Nursing, acting Associate Dean of the Faculty of Health and Social Development, and coordinator of the Master of Science in Nursing program at UBC's Okanagan campus. She has been described by colleagues as a masterful communicator, educator, clinician, researcher and a leader who exemplifies excellence as a professional nurse. 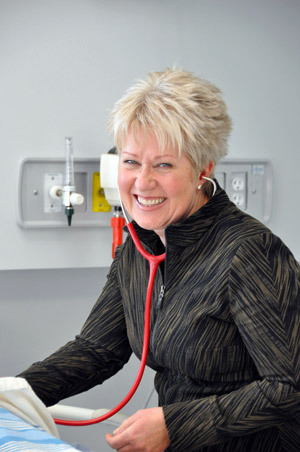 The award recognizes Robinson for her significant contributions to the lives of numerous cancer patients and their families and her extensive experience in a range of clinical environments, including serving as Regional Professional Practice/Academic Leader and later as Regional Nurse Coordinator with Pain and System Management and Palliative Care at the B.C. Cancer Agency (BCCA). "She not only provided direct patient care, but also mentored others and provided leadership in the development of programs for cancer survivors," says Nursing Professor Joan Bottorff, Director of the Institute for Healthy Living and Chronic Disease Prevention. Robinson's volunteer work includes service with the Canadian Association of Psychosocial Oncology, the Okanagan Partnership Economic Initiative, the Michael Smith Research Foundation, and the Kelowna-Zambia Health Initiative. "Her commitment to being an involved citizen of her communities is clearly demonstrated in these volunteer activities," Bottorff says. Robinson's research initiatives have received more than $2.5 million in research and educational grants from government agencies. Her research has also helped promote the health of the general public in terms of palliative care, particularly through rural and remote locations across B.C. This work addressed gaps in end of life care, family systems and healthy habits. Two faculty members from the School of Nursing at UBC's Vancouver campus were also honoured by CRNBC: Associate Professor John Oliffe was recognized with the Excellence in Nursing Research award, and Lecturer Marlene Groenig received the Excellence in Nursing Education award.